The ALUPILOT 14700 WJ is a High Speed Pilot Launch with water jet propulsion. The hull design was tank tested at Marintek in Trondheim, Norway to verify speed calculations and dynamic stability. The hull design is based on a 20-degree constant dead rise V-bottom modified with double chines giving a generous beam at deck level. The GRP sandwich construction wheelhouse offers round the horizon visibility and seating for up to four pilots. Flexible mounting of the structure helps to cut the internal noise level to below 70 db(A) at full speed. Below deck there is spacious crew accommodation with mess- room, pantry and toilet. Fendering is a combination of fixed fenders around the bow and on the quarters and bolted-on truck tires backed by substantial double sheer strake profiles along the hull sides. With twin main engines, the speed at the continuous rating of 2×508 hp at 1800 rpm is 30 knots. The engines drive Rolls-Royce KaMeWa FF-450 water jets through gears having a reduction of 1.1:1. With bigger engines speeds of 40 – 45 knots are achievable. 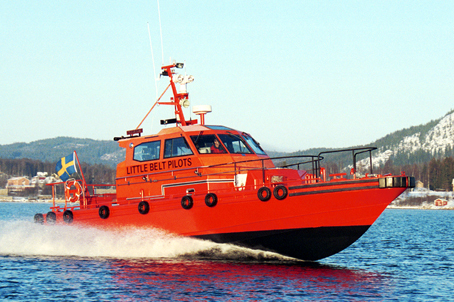 Classification is with Lloyd´s Register of Shipping with the notation +100 A LMC Pilot Vessel. This design is also available in a lengthened version and in a number of different layouts for pilotage and offshore support duties.